Please send me more information on Pacific Beach Horseback! 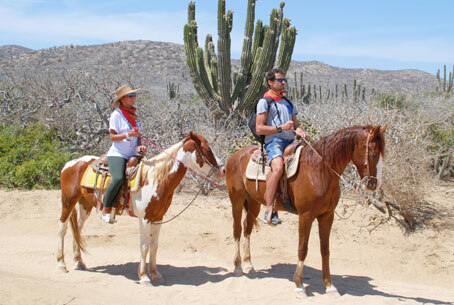 See the splendors of Baja firsthand, while atop a cooperative and handsome horse. 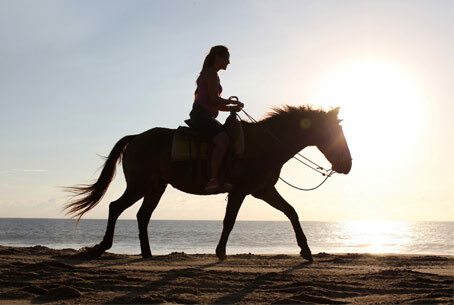 Discover spectacular ocean-side cliffs, lush desert ranges, private untouched beaches and canyon trails on a Pacific Beach Horseback ride. Horseback riding is the perfect way to enjoy the tranquility of the desert while contemplating the magnificent scenery and landscape. The energetic exhilaration of horseback trailing lets you feel in touch with the brilliant face of nature. Your 40-minute drive from the hotel will take you to Rancho Carisuva, along the mighty Pacific Ocean. At the ranch, you'll receive an orientation on horse-riding techniques; each participant will be assigned a horse based on their skill level. You'll also enjoy seeing the workings of a typical Baja ranch, with its traditional architecture, horses and barnyard stock, plus its visitor amenities. Hop on and follow your guide for a glimpse into Baja's rugged terrain, where along your ride you will see cactus over 20 feet high towering over the trail, wild animals, exotic desert flora and incredible views. Stops will be made along the way to view and discuss the desert flora and fauna. You can also enjoy the magnificent vistas at the lookout point over the Pacific Ocean. Don't forget your camera—the sights on this tour are one of a kind. Carisuva expeditions are a unique combination of adventure, contemplation and learning experiences, provoking delight in the abundance of Baja California's natural wonders while exploring the untouched off-track paths. Join us on this adventuresome tour that captures the best of Baja from a unique perspective. Minimum age is 6. Children under 8 must ride with an adult. All tours guided by bilingual Eco-Guides. Medical attention available on location. Please bring closed-toe shoes, long pants, sunblock and a light jacket. Camera recommended. Pregnant women or guests who suffer from back or neck injuries not allowed. Guests who are intoxicated will not be allowed on tour. Tour Approximate Times: 9:30am, 12:30pm, 3:30pm and 5:30pm (During summer). Ask your Cabo Specialist for availability, and arrange pick up times. Special and Private tours available upon request. Tour Includes: Medical insurance, bilingual eco-guide, well trained horse, bottled water, snacks and round trip transportation. Tour Includes: Round-trip transportation, snacks and water provided.